Keep seed from falling to the ground beneath your bird feeder using the Droll Yankees Onyx Seed Tray. This sturdy, polycarbonate tray attaches to the base of your Droll Yankees Onyx, Ring Pull, and New Generation feeder (not included) with its threaded wing nut. The raised center of the tray aligns with the innovative base of the Onyx feeders, allowing it to remain attached to the base while the feeder is cleaned and refilled. A lip at the edge of the tray keeps seed in place, and twelve drainage holes help excess water to escape. A hook on the base of the wing nut accommodates an additional feeder, and may hold up to 25 pounds for added versatility. 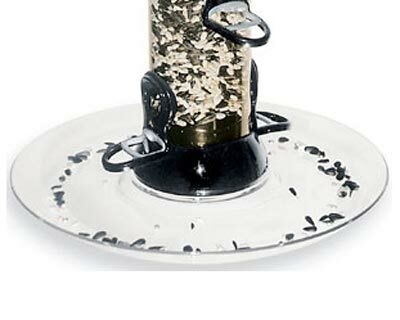 Invite more birds to dine from your tube feeder with this Onyx Seed Tray. Made in the USA. Note: This description refers only to the Droll Yankees Onyx Seed Tray, 10.25" dia. The feeder shown is not included.